This is a follow-up to a recent post on the income-expenditure (IE) model and is at a similar introductory level. Some knowledge from the previous post is assumed, so for those unfamiliar with the model, it would be best to read that post before this one. The purpose is to explain how the model can be represented graphically in a two-panel diagram. The top panel shows equilibrium and disequilibrium adjustments in terms of income and planned expenditure. The bottom panel shows them in terms of planned leakages and injections. Cd, Id, Gd, Xd, Md and Td are desired consumption, investment, government spending, exports, imports and taxes. All variables are in real (meaning price-deflated) terms. 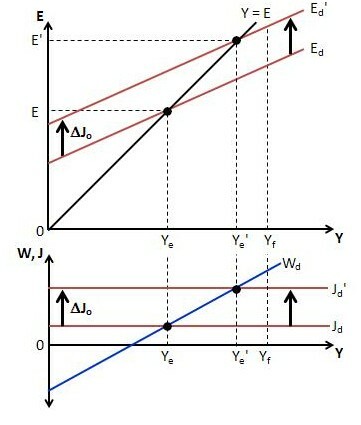 The ‘o’ subscripts indicate exogenous variables. They are autonomous of income. The parameters c, t and m are the marginal propensities to consume, tax and import. where s (= 1 – c) is the marginal propensity to save. The IE model can be represented by a two-panel diagram that includes schedules for desired total expenditure (Ed), leakages (Wd, for ‘withdrawals’) and injections (Jd), all expressed as functions of income. This is a straight line, as are all the schedules. The sum of terms within the first set of parentheses is the vertical intercept. A change in any of them will cause shifts in Ed. The expression in the second set of parentheses is the slope. The first bracketed sum is the vertical intercept and the second is the slope. In the lower panel, the Jd schedule is horizontal because injections are assumed exogenous and so independent of income. The Wd schedule is upward sloping because as income rises, there is some leakage to saving, taxes and imports. Equilibrium occurs at the point of intersection where desired leakages equal desired injections. 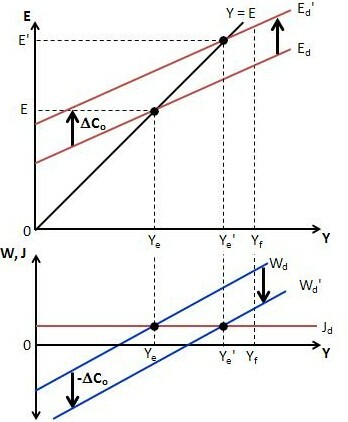 In the upper panel, a 45-degree line shows all the points at which actual total expenditure, E, equals income. Because of leakages, the Ed schedule is flatter than the 45-degree line. In other words, its slope is less than 1. In equilibrium, Ed equals both actual expenditure and income. Notice that equilibrium income is below the full-employment level, Yf. The model’s income-adjustment process is applicable to situations where there is unemployment and excess capacity. At full employment, there would be no room for further increases in real income. Consistent with the model’s Keynesian causation, there is no automatic tendency for the economy to move to the full-employment level of output. Full employment would only happen by fluke or by government policy design. In the lower panel, the Jd schedule shifts up. 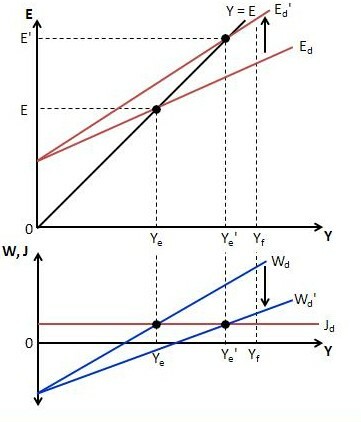 At the initial equilibrium income, Ye, Jd would exceed Wd, indicating disequilibrium. However, the extra injection of demand causes a multiplied increase in income. This adjusts desired leakages to the higher level of desired injections. This is represented by a movement up along the Wd schedule. The process is complete once equilibrium is restored. In the upper panel, the extra injection of spending causes an upward shift in the Ed schedule from Ed to Ed‘. It is again clear that the initial income level, Ye, can no longer constitute an equilibrium position because at that level of income desired total expenditure exceeds income. The excess demand causes an unanticipated depletion in inventories and firms are assumed to respond by expanding production. This causes income to rise, represented by a movement up along the 45-degree line. The income growth induces additional consumption, represented as a movement up along the Ed‘ schedule, but also some leakage, ensuring that income, moving with steeper slope, eventually catches up to desired total expenditure. 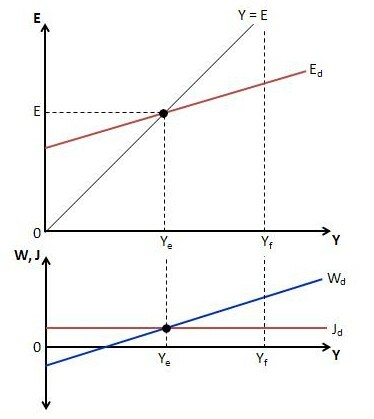 As a result of the process, a new equilibrium is reached in which income is fully adjusted to desired total expenditure. Increase in autonomous consumption.. An increase in autonomous consumption has the same effect in the upper panel as an increase in planned investment, government spending or exports, but plays out differently in the lower panel. In the lower panel, an increase in autonomous consumption causes a downward shift in the Wd schedule. This is because –Co is a term in the saving function. An increase in autonomous consumption is equivalent to a decrease in autonomous dissaving. With the Wd schedule below the Jd schedule at the initial equilibrium income, Ye, there is a multiplied increase in income. This induces additional leakages. At the new equilibrium, there is higher income but the same amount of injections and leakages as in the initial equilibrium, due to the increase in autonomous expenditure. A reduction in the marginal propensities to leak.. If one or more of the marginal propensities to save, tax and import are reduced, due perhaps to a structural, cultural or institutional change, the slope of the Wd schedule gets flatter and the slope of the Ed schedule gets steeper. There will be a higher equilibrium income for any level of net autonomous expenditure: a larger multiplier. Note. This post originally had a second part on the ‘sectoral financial balances model’. Upon deciding that the second part should be included in the ‘Posts to Read First’, I turned it into a standalone post. This was in the hope that it would not get lost underneath what remains of this post, which is intended more as a technical addendum to the earlier post on the income-expenditure model. I can’t believe I’m going to say this, but I think I liked you better when you were talking about Jesus and Mary. Blacklist me if I start getting boring. Thanks, Andy. I probably should have done this post and the previous one on the IE model a long time ago but never got around to it. I find all economic graphing, not just these ones, incomprehensible. Mostly because none of them represent a graph per se. Random thought after writing the above: I wonder if I would comprehend them if they were done as 2 or more graphs instead. You know, instead of the multiple option graphs done on the one set of axes. If you followed the previous post on the income-expenditure model, the first part of this post just expresses it in graph form. You don’t need to understand the graphs if you understand the earlier post, and vice versa. You can treat the two panels separately, if you prefer. Consider the top panel in isolation. The 45-degree line is just like the y = x line in algebra. It shows all the points where actual total expenditure equals income. Remember that Y = E is an identity, true by definition. Income equals expenditure. However, the identity does not imply equilibrium. Equilibrium requires that PLANNED or DESIRED or EX ANTE total expenditure equals income. This occurs when the desired expenditure line intersects the 45-degree line. At that point desired expenditure equals both actual expenditure and income. The desired expenditure line is upward sloping because desired spending increases with income. There are the exogenous parts of spending which don’t change with income, and the endogenous part (induced consumption) that rises with income. So overall the line is upward sloping. Higher income is associated with higher desired expenditure. The bottom panel can also be considered in isolation. Desired injections are assumed exogenous, so they don’t change with this period’s income. This is why the line is horizontal. The level of desired injections doesn’t change as income increases. The desired leakages do rise with income, which is why the leakages line is upward sloping. Higher income means higher leakages to saving, taxes and imports. Equilibrium requires that desired leakages equal desired injections. This occurs when the two lines intersect. At other points on the two lines, it is still true that actual leakages equal actual injections, because this is true by identity. But it won’t be true that desires match. Consider any point on the desired injections line other than equilibrium. At such a point, desired and actual injections equal actual leakages, but they don’t equal desired leakages. There is disequilibrium. My main motive for doing this post was to discuss the SFB model. Its diagrams are very simple. Perhaps I should have discussed the SFB model in a separate post, rather than include it in one long post. Doing it this way saved having to repeat the description of the underlying model (equations 1-8), which is the same for both the IE and SFB analysis. It also avoided needing two posts of a type that might seem dry for some readers. If people just read one part of this post or the other, it would be better to read the part on the SFB model. Incidentally, the previous post on the IE model and the diagrams in the first part of this post are part of Econ101 at university, at least in Australia (or, at least, they were in the past). The second part of this post on the SFB was not taught explicitly when I was at university (maybe this has changed now) but easily could be, given the closeness of the two models, as explained in the post. I understand the previous post on this subject matter. I just cannot comprehend or intuit how someone can look at those “graphs” and understand them. Call them simple all you like. They are not. I could probably master them with training but from (ironically) a non-econ perspective they’re incomprehensible. As I understand these charts, they’re not really graphs but an IF, THEN statement. Maybe closer to an IF, SHOULD statement. And that’s why I haven’t done Econ via Uni. Couldn’t make sense of the nonsense charts and even when Steve Keen gave his UWS lectures on YouTube he used big words where small words would do. I knew what each word meant but at the clip he spoke, had to pause, breakdown that word in to the small words to fully comprehend the context. I don’t recall what level of class that was. For me, it is these little things that make econ an elitist profession that hides behind jargon and charts. To be clear, I’m not putting that label on you Peter. I think you do a great job. Not that I could afford to re-attend Uni and there is no longer an Econ course in Australia worth taking. Its all arse backwards Commerce degrees with Majors and Minors in Econ. Should be the other way around. these graphs are not statistical graphs but geometric graphs.